Blog | Genevive Bjorn, M.Ed. Understanding a cancer diagnosis and treatment options can feel like going back to school in a nightmare. However, this time the exams are ultra invasive, and the results mean life or death. Meanwhile, high school biology feels like a very long time ago. Where is your science teacher when you need her? Cancer Commons offers support in all areas of cancer treatment. By comparison, the other organizations specialize in one type of cancer, such as pancreatic, lung, or breast. There are no limits on how many organizations a person with a cancer diagnosis may access for support. Likewise, the U.S. government offers a searchable database of clinical trials. Many people with a cancer diagnosis experience a very large gap of understanding. It can feel very frustrating. One one side, the physician or oncologist explains the situation in the office visit and often does not have time to answer every question. On the other side, patient questions about basic cancer biology typically fall outside the scope of meetings with oncologists. There is not enough time. 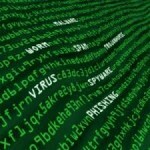 Instead, people with a cancer diagnosis turn to the internet and search. Which information is accurate and reliable? It is hard to know as a non scientist. In my tenure as a high school science teacher in biology and chemistry, I have helped many people understand their cancer diagnosis and treatment options. I adapt powerful classroom-based learning tools to help people understand their very real world situation of cancer. Many cancers involve genetic mutations. Some cases are relatively straightforward. For example, one mutation at the BRCA1 gene is related to breast and ovarian cancers. However, other cancers present very complex mutations that increase as the disease progress. For example, a person with stage IV colorectal cancer may have more than a dozen mutations, with more surfacing at each check up. Either way, many people with cancer understand their situation better by using some learning tools. People facing multiple treatment options for cancer often need support with decision making. Certainly the diagnosis alone is stressful enough. Throw is a bunch of options no one understands, and oy vey! Likewise, students in my science classes face a similar dilemma about data because they gather and analyze a lot of data. Often students have more data than their minds can make sense of easily. Therefore, we use simple, powerful tools to improve decision making. For example, a person with an early stage diagnosis asked for help understanding the various treatment options. He wanted to make the best treatment decision. I generated the decision matrix shown in figure 3. Specifically in figure 3, there are spaces for objective medical outcomes, such as life expectancy and cancer recurrence. In addition, there are spaces for subjective outcomes that matter to him. These could include time away from work or the ability to travel within a few months after treatment, for instance. Figure 3. 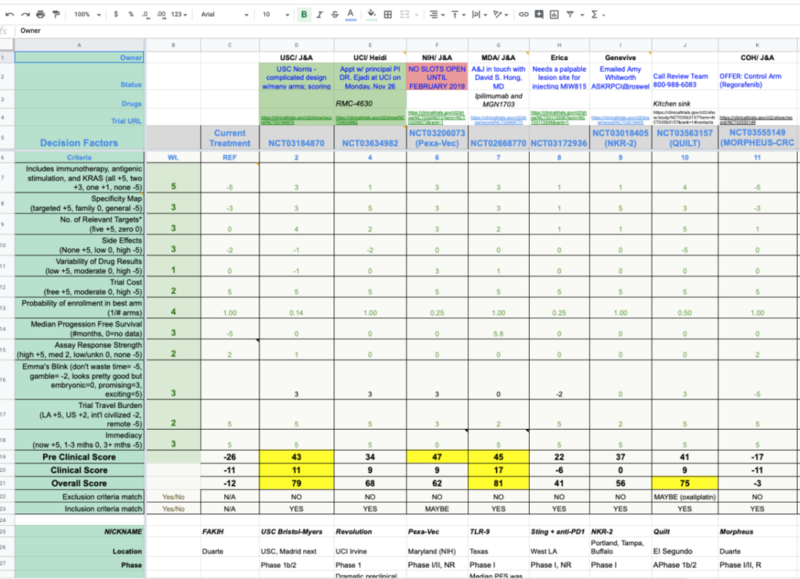 Screen shot of a decision matrix for early stage pancreatic cancer treatment. Click here to view the original file and make a copy. As cancers progress, the choices become more complex. For example, a person with stage IV metastatic colorectal cancer asked for help choosing a clinical trial. Subsequently, the decision matrix became more complex. For example, figure 4 shows a screen shot of a decision matrix for clinical trials to treat late-stage metastatic colorectal cancer. There are multiple factors, weights, and trials because this is a complex cancer. There are also inclusion and exclusion criteria that, as a result, qualify or disqualify him. The grain of analysis is finer in this version than figure 3. Moreover, this particular tool can become as complex as needed. Figure 4. 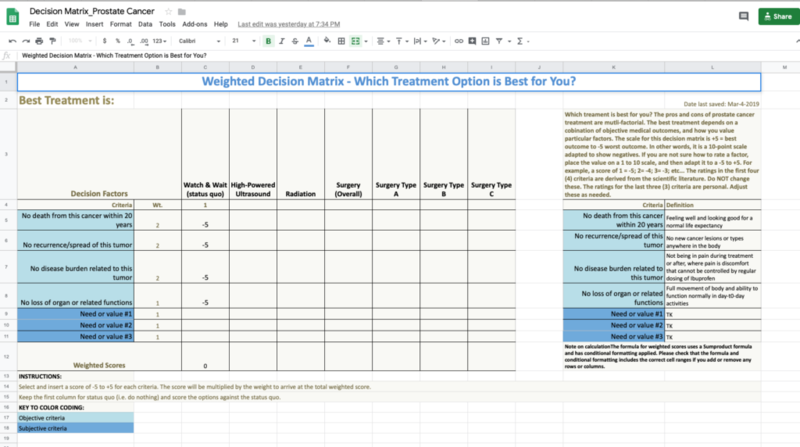 Screen shot of a decision matrix to identify clinical trials to treat late-stage metastatic colorectal cancer. Mapping is a power visualization technique that helps people easily understand a cancer diagnosis and treatment options. 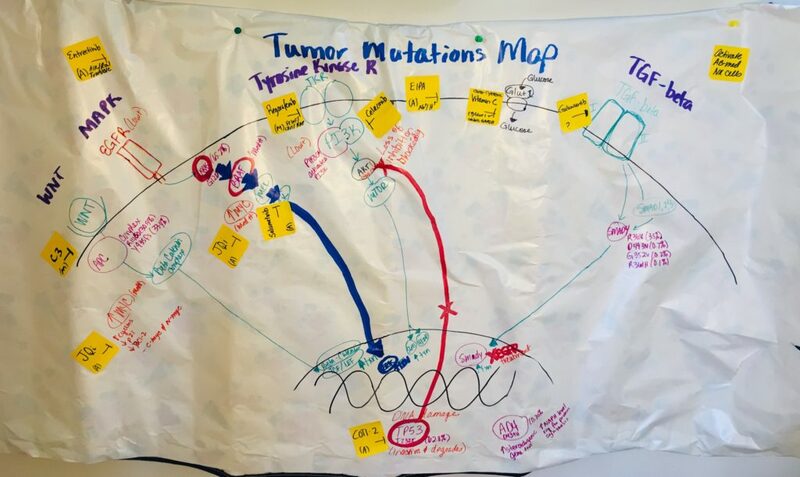 Mutation maps are a technique that I adapted from my classroom to the help people understand the basic biology of a cancer diagnosis and treatment options. 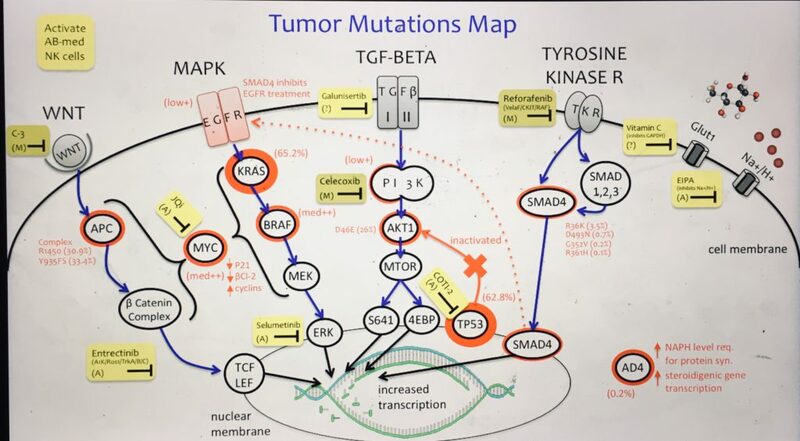 For example, figure 1 below shows a rough draft of a complex tumor mutation map for a case of stage IV colorectal cancer. In the biology classes I teach, I use mapping as a way to help students visualize multi-step processes or relationships in the body. It is powerful. Our brains are built to make sense of visual input, not long lists of numbers and letters. Figure 1. Rough draft of a complex tumor mutation map for a case of stage IV colorectal cancer. Moreover, transforming a hand drawn tumor mutation map into a digital version helps to clarify the situation. 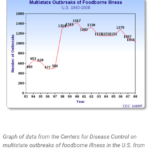 For example, figure 2 shows the map from figure 1 cleaned up and digitized for clarity and ease of understanding. The yellow tags show treatment options and the targets of their actions. Likewise, this helps people understand how different treatment options work on specific genetic mutations. Figure 2. Final digital version of the complex tumor mutation map for a case of stage IV colorectal cancer. Do you have ideas for how to adapt science classroom-based learning tools to the very real-world problem of understanding a cancer diagnosis and treatment options? If so, I would love to hear from you. Please comment below or tweet me @genevivebjorn. Genetic counselors report one of the highest levels of job satisfaction at 94%, according to recent survey data published in 2018 by the National Society of Genetic Counselors. What is behind the high rating? To find out, I interviewed a non-scientific sample of six genetic counselors working in three areas: clinic, private laboratory, and academia. All of the counselors were licensed or had passed the board exam, all graduated from accredited genetic counseling training programs, and all were willing to share basic information about their job descriptions as genetic counselors (i.e., work day, salary, length of service, background, training, and motivation for the career). I summarize the findings of how genetic counselors view their jobs in the following word cloud. Words closer to the center and in larger font occurred more frequently in the interview transcripts. 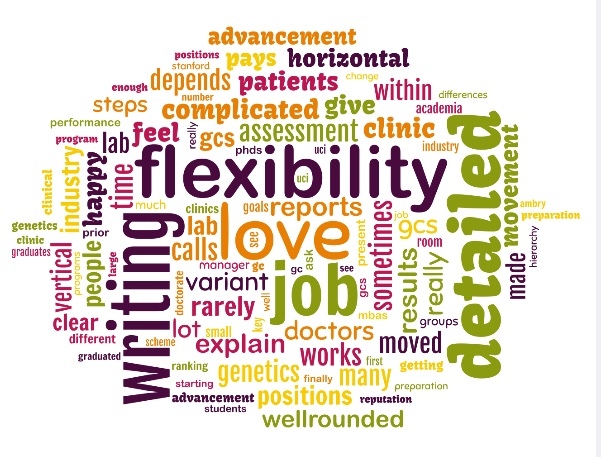 The word cloud reveals the most frequent words in my interviews with genetic counselors about their job descriptions were: love, job, flexibility, detailed, and writing. For anyone considering genetic counseling as a career, these words provide a snapshot of some current practitioners’ views about their jobs. With love at the center, it’s probably hard to go wrong. Teaching a group of diverse and high-needs learners chemistry in San Diego near the U.S. border with Mexico, I encountered a vexing problem: students loved to do lab and hated to write lab reports. In fact, most never turned them in. I couldn’t ignore it because lab reports give students an important opportunity to develop critical thinking and communication skills. So I generated an innovative solution that increases the turn-in rate while also supporting students with learning challenges, including students with disabilities and those who speak English as a second language. Find out more in the April 1, 2018, issue of The Science Teacher. Thinking about going back to school and earning your doctoral degree? If so, it is important to ask the right questions. There are a growing number of online doctoral programs available. I recently shopped for an online doctorate in the field of education. Very quickly I realized that the usual ranking systems (i.e., US News) do not apply. Many brand-name schools are rolling programs with high price tags, and the quality of these programs varies widely. Is there departmental or university-based funding for online doctoral students that does NOT have to be repaid? How many students will be admitted to the program this year? How many students were admitted to the program last year? How does program handle issues and difficulties that arise with remote advising? How many students graduated from this specific program last year? What happens if I need to take a break? What are the face-to-face meeting requirements? Think of something else important to ask? Please share your comments.